Home / Classy Filipino magazine / Writing / Classy Filipino Magazine Now Available! Classy Filipino Magazine Now Available! 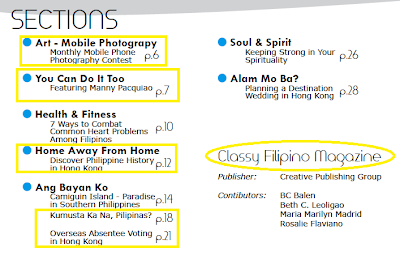 Classy Filipino magazine is now available with its maiden issue for April 2013. This magazine is distributed for free throughout Hong Kong, Macau, and China. It follows the no-nonsense, non-gossip formula and features only the best in arts, travel, tourism, economics, health, fitness, spiritual, and everything which Filipinos all over the world can relate to with that feel-good vibe. I’m quite excited to be a part of the team of contributing writers who have written content for the first ever issue of the magazine. I’ve also highlighted each section/feature I’ve contributed. See image above. If you based in Hong Kong, Macau, and China, you can grab your copy for free. 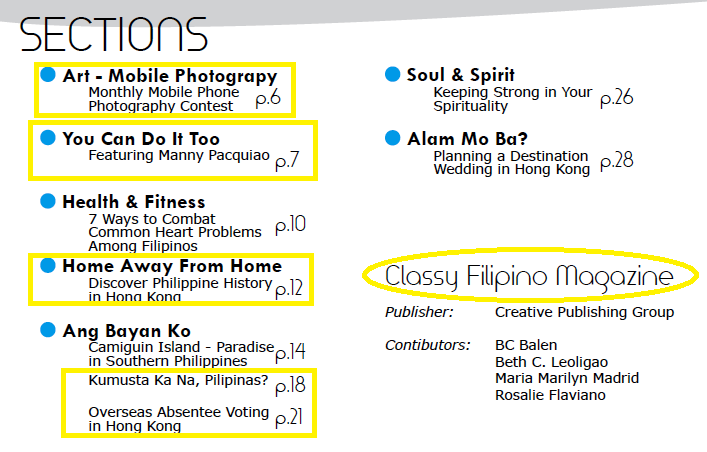 You may also view and download a digital version copy through Scribd - Classy Filipino Mag Maiden Issue v1 (72dpi). Everyone is Hong Kong is invited to may also submit photos through the Photography section. Your comments, feedback, and suggestions including possible future topics for each section are highly encouraged. You can leave your message through classyfilipinohk@gmail.com.